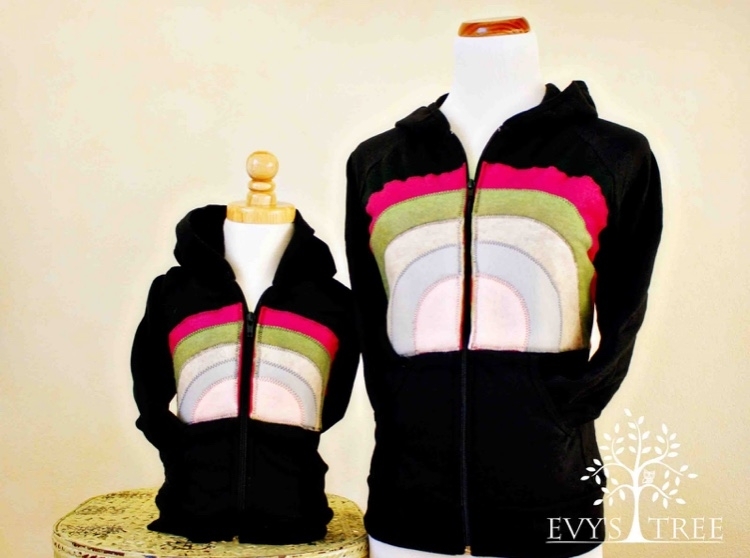 Many of our long-time Evy’s Tree friends will instantly recognize The Rainbow hoodie…you’ve asked for us to bring it back, and finally we are able to do so! Please join us in welcoming The Rainbow once again! 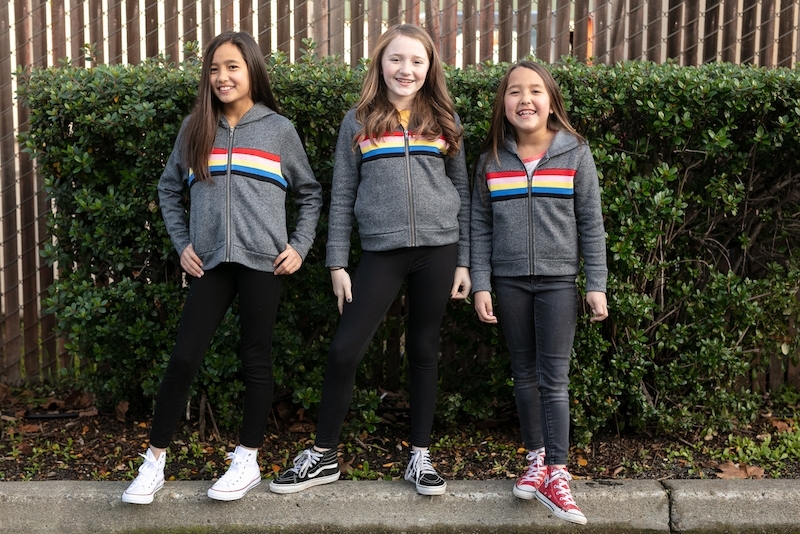 Those Rainbow hoodies sold out quickly and have been one of the most frequent requests for a remake, and with several upgrades in design and style, we hope you love them as much as we do! The new Rainbow is in a new, ultra comfy fabric that is brushed and slightly heavier weight, with a fleece backing for an extra element of warmth. With a neutral-toned, heather grey body and matching waistband and cuffs, the actual rainbow is a bold statement piece made from a sweater fabric for contrasting texture and to add to the stylish retro updated design. We included the essential side pockets and simple hood. 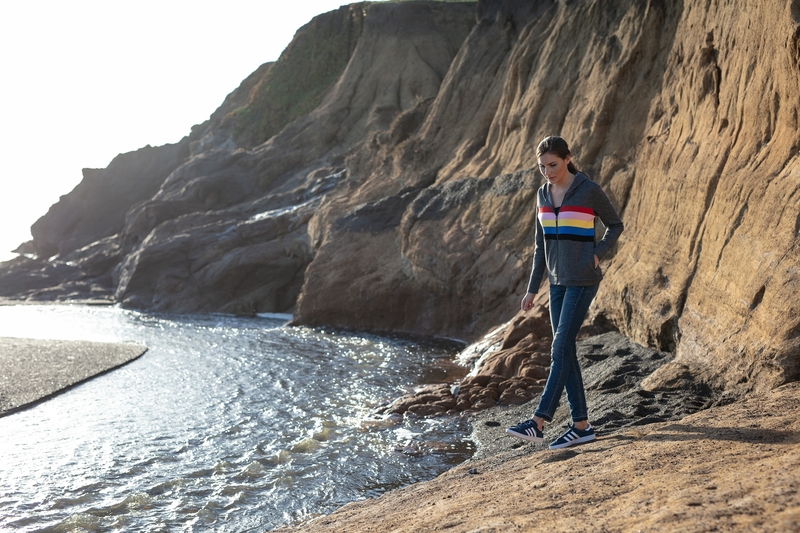 Designed for a cozy fit, this carefree hoodie is true to size and will bring a sporty, fun vibe to anything the chic modern girl would like to wear! And of course, we must include a mini Rainbow for any Honey girl who wants to match her cool mom, or just look fabulous on her own! In keeping with the retro style, the Rainbow is a traditional, classic ‘sweatshirt’ fit and is not as fitted as many Evy’s Tree pieces. While not considered oversized, it is considered roomy and will easily layer over lighter weight pieces like simple tanks or tees. The waistband is stretchy. You can likely stay in your usual size. Young girls could easily size up if they’re between sizes, to allow for room to grow.